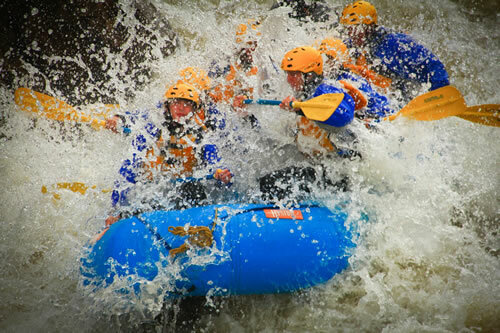 The Clear Creek Advanced Full-Day is one of the most action-packed in the state. Put-in at 8000ft , and experience the steep and narrow upper Clear Creek. After enjoying your delicious all-you-can-eat lunch, experience the Advanced Canyon! Run Double Knife, Guide Ejector, Terminator, Hell’s Corner and many more as the canyon walls loom high above. With 30 major rapids and over 20 miles of the most continuous whitewater in the state, this steep canyon run will satisfy even the most healthy whitewater appetites. Duration: 5-6 hours.